Ahobilam is a unique kshetra where Lord Narasimha is worshipped in nine forms in His swayambu roopa. It is believed the Lord manifested Himself from a rock cave to kill Hiranyakasipu. Ahobilam is located near Allagadda taluk headquarters, on the Nandyal - Cuddapah road in Kurnool district of Andhra Pradesh. 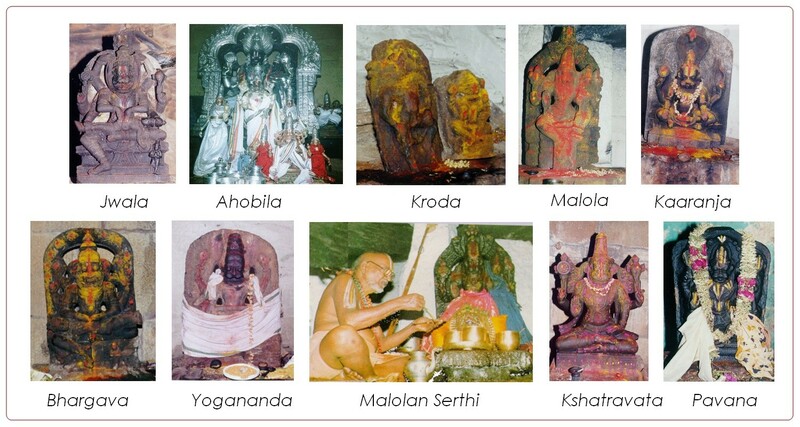 The Sthala Puraana of Ahobilam in Sanskrit, describes nine forms of Narasimhas which are situated at various places along the different hills and vales here. 9. 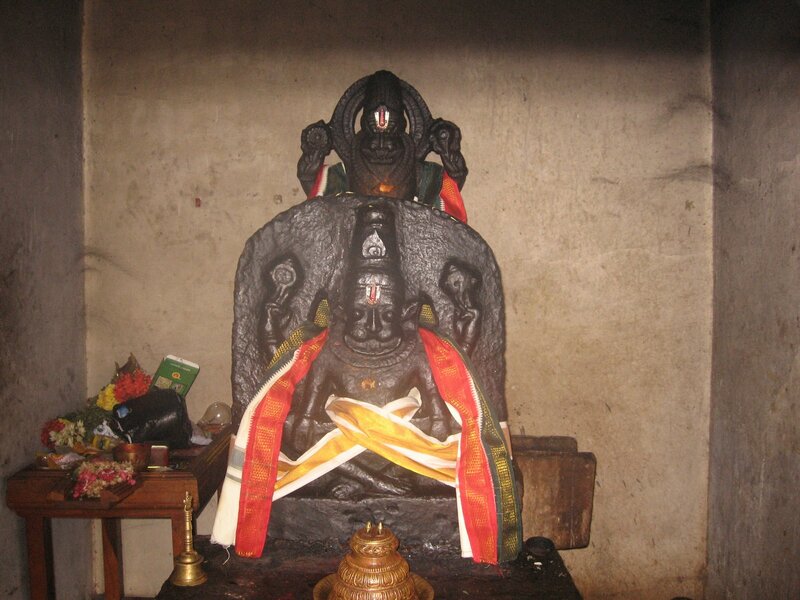 Paavana or holy Narasimha. In addition to the above mentioned shrines, there is a famous shrine dedicated to God Narasimha Swamy in Lower Ahobilam, which is popularly known as Prahlaada Varada Sannidhi. There are another 2 shrines known as Ugra Sthambham and Prahlaada Mettu. The Khetra Mahaatmyam of the Simhaachalam temple says that there are four important sacred places on the earth. Ahobilam is one of them, the other three being Simhaachalam, Krutasoucham and Harampapam. The Sthala Puraanam of the temple is said to be an extract fom the Bramhaanda Puraanam with 10 chapters enclosing 1046 verses composed by Maharshi Veda Vyasa. Ahobilam is also mentioned in the Mahabhaarata, Raamaayana, Koorma Puraana, Padma Puraana and the Visnu Puraana. This sacred place was the kingdom of Hiyanyakasipu in the Krita Yuga and Lord Lakshmi Narasimha came out of the pillar and destroyed him. This place is called Vedaachalam, Garudaachalam and Veera Kshetram. It is also known as Singavel Kundram. Tirumangai Azhwar, a famous vaisnavite saint praised this Lord as " He other than whom nobody can enter reside in this Kshetra." The other version is that because of the great cave, the Aho-Bhila, where Garuga worshipped and realised the Lord, the place itself has been come to be called as Ahobhila. It is said that Lord Brahma worshipped the Lord with the Ahobila mantram. 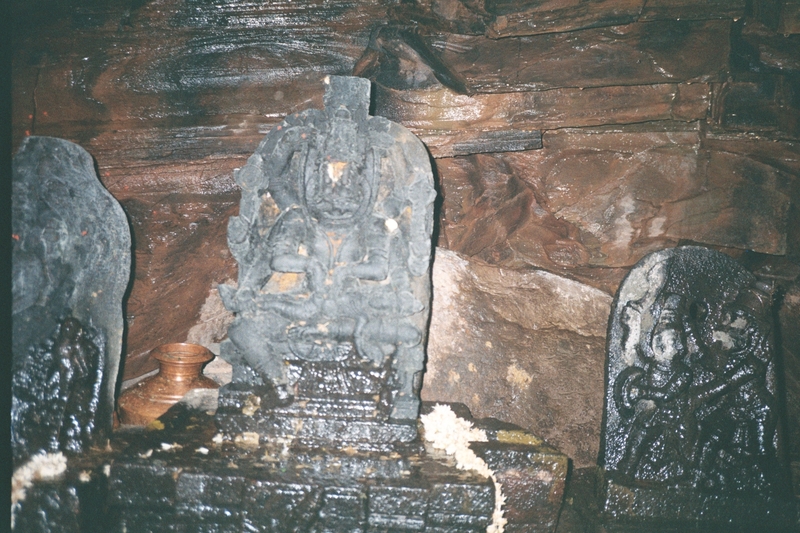 Besides Brahma, Ahobila Narasimha was also worshipped by Rudra ( Sri Manthra Raaja Pada Sthothram, Ahirbudhnya Samhita, Paancha Raathra Aagama), Raama ( Vaalmiki Raamaayana ) and Tirumala Tirupati Venkateswara Swamy also called Srinivaasa. Ahobila Narasimha is praised as " Periya Periya Perumal " in Tamizh. The Ahobilam Kaifiyat, a digest from the village registers prepared by the Mussaddis working under Col. Mackenzie gives support to this legend. As per this record, " On one of the mountains in the Nallamalai hills range, eight amadas from Srisaila Kshetram, Garuda commenced silent penance to obtain a vision of Lord Narasimha. The Lord in His grace, after long years of penance of Garuda, manifested Himself in the cave of a mountain. Ten 'Paruvu's to the north-east of the mountain, where Garuda was doing penance, a vision of His manifestaion was then granted to Garuda, who after obtaining a sign of the location of the mountain-cave, gladly travelled thither and saw the embodiment of the Satsvaroopa, MahaaPurusa, Lord Jvaalaa Nrusimha, not easily accessible to common people. Garuda then praised the Lord that " Ahobilam is Mahaa Balam." 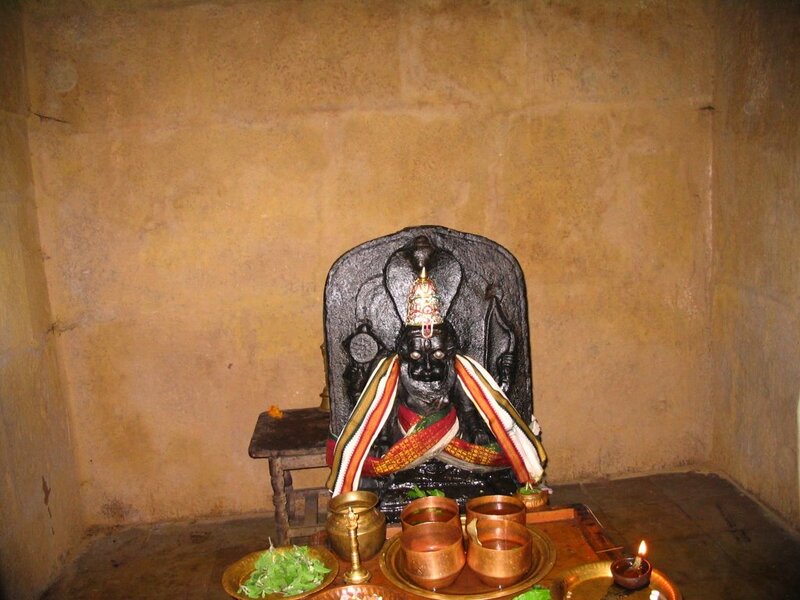 The Lord's divya mangala vigraha was worshipped by him with several stothraas. Garuda then considered himself blessed. The divine place thereafter ontained the deserving name of Ahobilam. The mountain on which Garuda performed tapas became famous as Garudaachala. In the days of yore when truth and Dharma prevailed, great heat was observed near the mountain-cave of Ahobila. According to legend, when green grass was put in the cave, it would catch fire and smoke would be emitted. Several great rishis lived there for a time. After sometime with the knowledge that great places would become common Janapadaas in Kali Yuga, they left for northern lands covering up the cave with boulders. Traditionally, the place is being called as Narasimha Kshetra. Long long ago, the tamizh mystic bard, Tirumangai Azhwar sang that Singavel Kunram was accessible to none but Gods. This is true even today, since the area and the hills are covered with thick vegetation, thorny bushes and forests where leaves rustle and crickets screech. 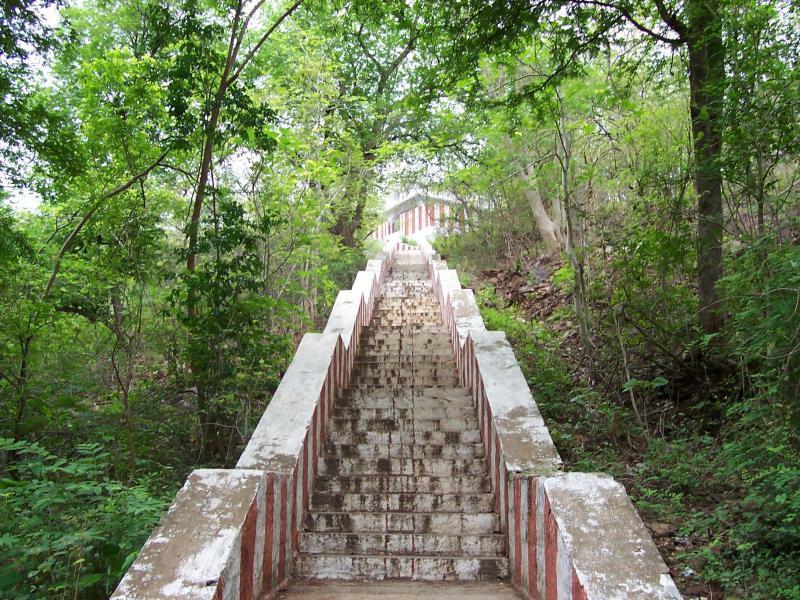 The whole complex is in two parts - one called Yeguvu / Upper Ahobilam with the Nava Narasimha shrines and the other called Diguvu / Lower Ahobilam with a single shrine for Lakshmi Narasimha connected by a road, stretching a distance of about 12.8km from Lower Ahobilam to Upper Ahobilam. From there, the other shrines are to be reached only by trekking and managing difficult terrain, flowing streams and slippery rocks. The nature is bounteous there affording plenty of water by way of ponds, brooks and resting places under shades of forest growth. One can witness several cave like rocks on the way. Quite an adventurous trip indeed to be enjoyed if one has faith, will power and devotion. Lions dwell in these forests and no wonder that the man-lion manifestation took by Lord Narasimha chose to dwell in similar surroundings. 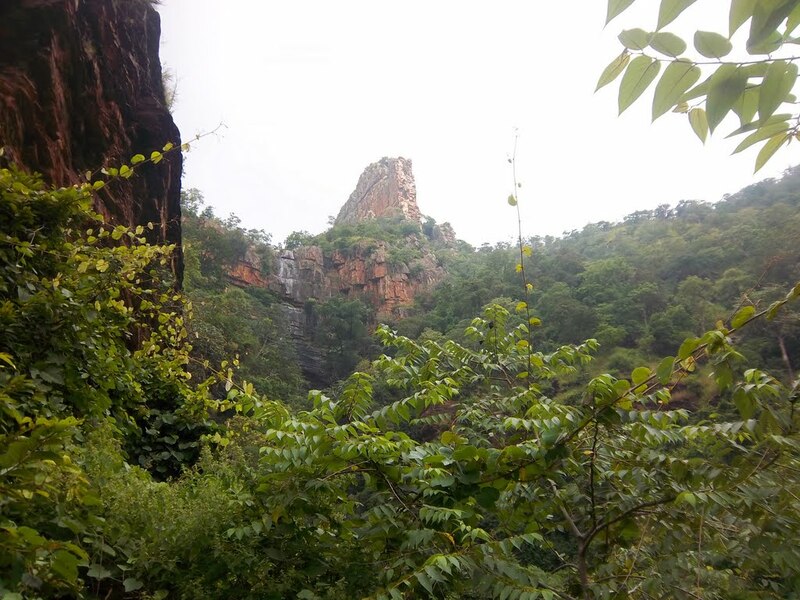 If one can undertake a strenuous traverse of 8 km from Upper Ahobilam, one can see the Ugra Sthambham known as Ukkukambamu, the pillar on the mountain said to be the one from which Lord Narasimha emerged in response to Prahlada's prayers. 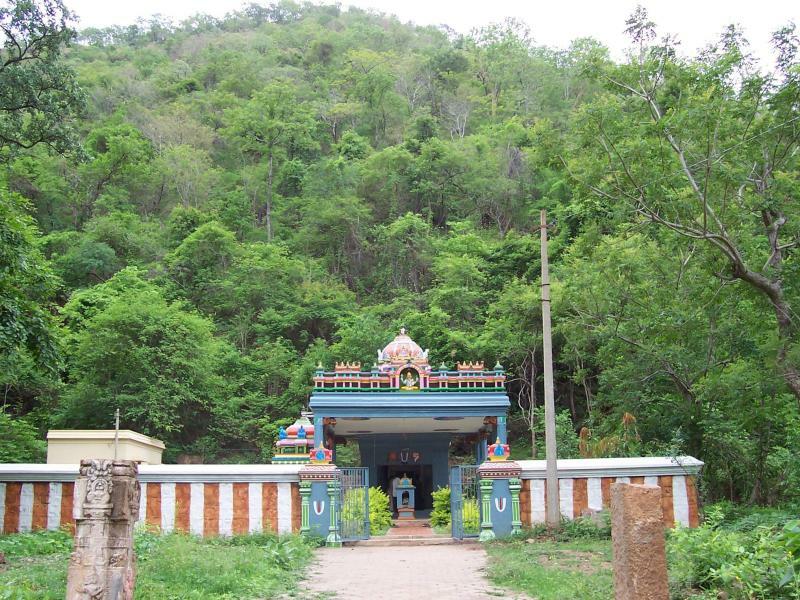 The Bhargava Narasimha Swamy is situated at a distance of two kilometres from the Lower Ahobilam, on a hill, near the sacred pond, known as 'Bhargava Theertham', where Bhargava Rama performed his penance. 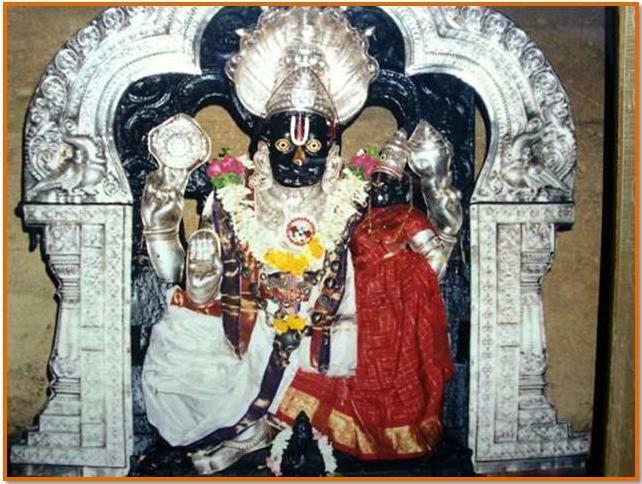 Hence the Lord of the temple is known as Bhargava Narasimha Swamy. 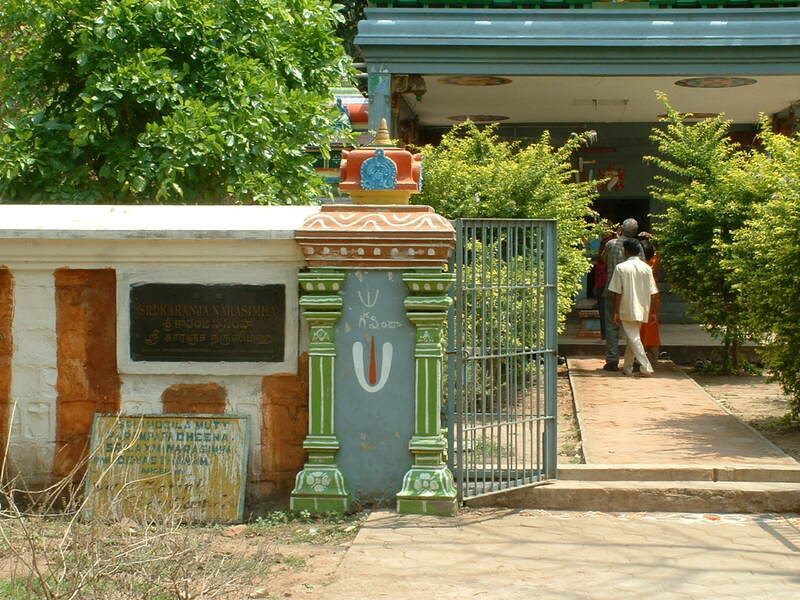 This temple is to the south-east of Lower Ahobilam at a distance of 2 kilometres. The popular legend is that after killing Hiranyakasipu, Lord Narasimha taught Prahlada several yogic postures. Therefore, the Lord in this aspect is called Yogananda Narasimha. Opposite To Yogananda Swamy Temple. About three kilometres from lower Ahobilam, the image of the deity is installed under a peepal tree, surrounded by thorny bushes. Hence, the Lord is called as Chatravata Narasimha Swamy. 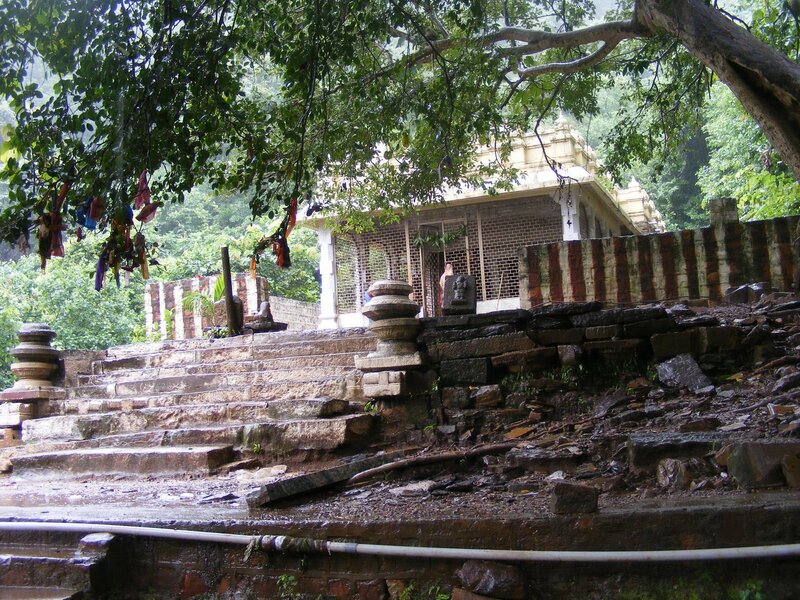 The temple, situated on the Upper Ahobilam, at a distance of eight kilometres from the Lower Ahobilam, is the main temple and the earliest of all the nine temples there. The Lord here appears in his fierce aspect, called Ugra Narasimha, who is the presiding deity of the temple and is known as Ahobila Nrisimha Swamy. 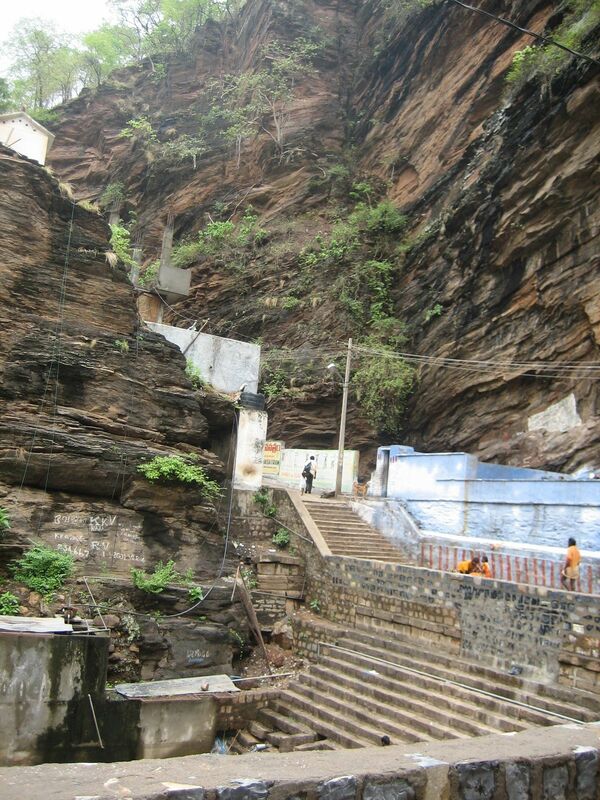 It is firmly believed the Lord Narasimha was 'Svayambhu' (self-manifest) here. The temple of this Lord is one kilometre away from the main temple of Ahobila Nrisimha Swamy on the Upper Ahobilam. The image of the deity has the face of a boar (varaha or kroda) and the Lord is seen along with his Consort, Lakshmi. 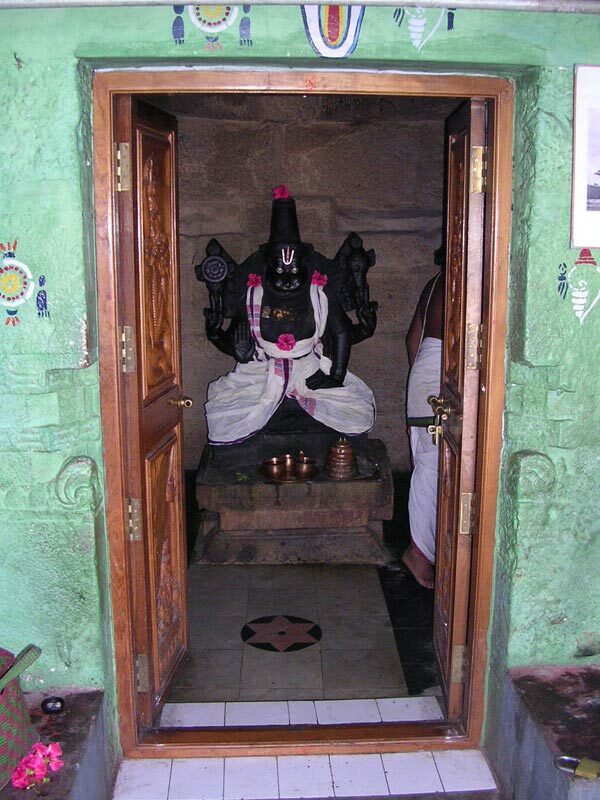 Hence the Lord of the temple is known as Krodakara (Varaha) Narasimha Swamy here. Krodakara (Varaha) Narasimha Swamy Temple. This shrine is situated at a distance of one kilometre from the Upper Ahobilam and one furlong from the road leading to Lower Ahobilam. The image of the deity is installed under a tree, called 'Karanja Vruksham'. 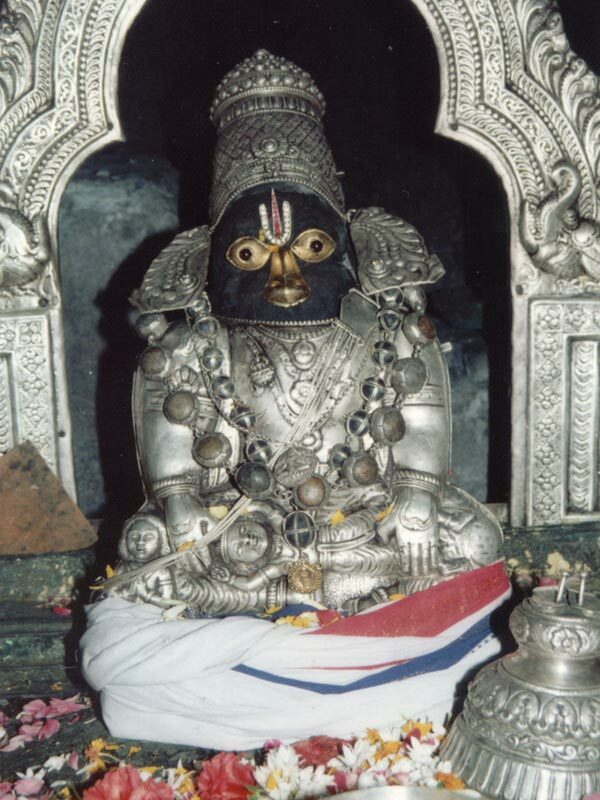 Hence this Lord is called Karanja Narasimha Swamy. Nearly two kilometres from the main temple of Upper Ahobilam, is the famous shrine of Malola Narasimha Swamy. The deity here appears in 'soumya' (graceful) form. As Lord Narasimha is seen with his consort, Lakshmi, He is known as Malola Narasimha Swamy. The word 'Malola' means beloved to Lakshmi (Ma=Lakshmi, Lola= beloved). It is said that the 'utsavamoorthi' of the Lord appeared to Srimath Adivan Satakopa Jeeyar, the first Jeeyar of Ahobila Mutt. Right from the founder, i.e., the first Jeeyar of Ahobila Mutt down to the 44th pontiff, Srivan Satakopa Sri Vedanta Desika Yatheendra Mahadesika, the present jeeyar, the utsavamoorthi of Malola Narasirnha Swamy is worshipped and it is taken by them whenever they are on religious tours, visiting the villages every year. Recently, the 45th Jeeyar Srivan Satakopa Sri Narayana Yatheendra Mahadesikan has taken over the worship. The temple of Jwala Nrisimha Swamy, lies higher up the above temple, on a hill called, 'Achalachaya Meru'. 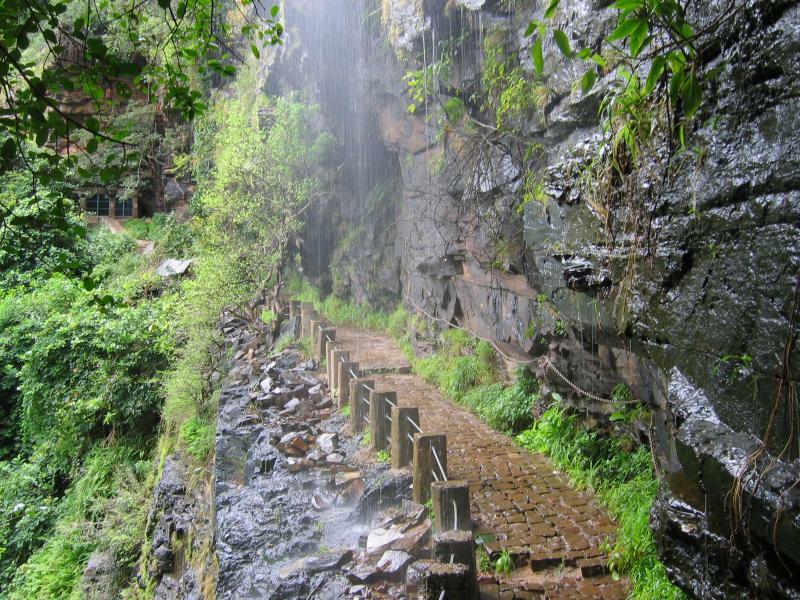 This is about four kilometres from the Upper Ahobilam temple. This place is said to be the actual spot, where the fierce anger of the Lord reached its culmination when he tore Hiranyakasipu. 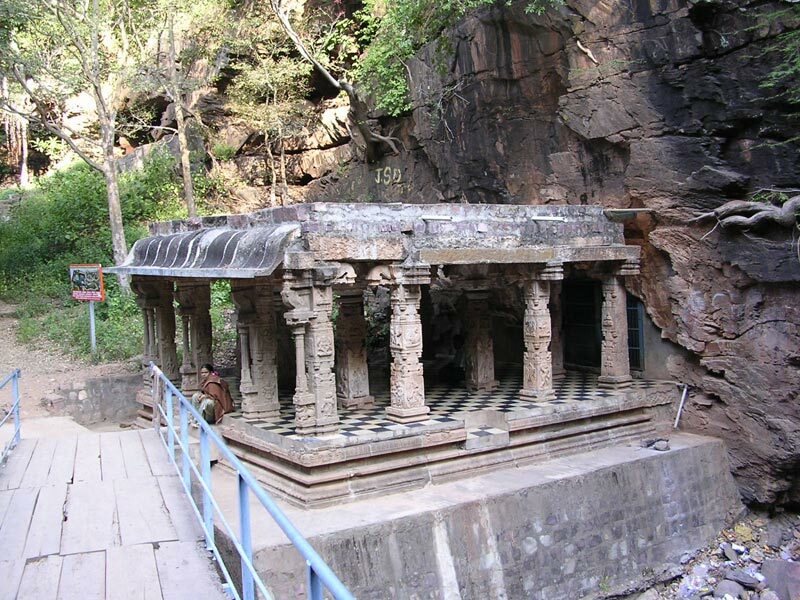 Nearby the above temple, is the shrine of Pavana Narasimha, on the banks of the river, Pavana and it is about six kilometres from the Upper Ahobilam temple. Hence the Lord of the shrine is known as Pavana Narasimha Swamy. In addition to the shrines mentioned above, there is a famous shrine dedicated to God Narasimha Swamy in the Lower Ahobilam, which is popularly known as Prahlada Varada Sannidhi. The other objects of this place are 'Ugra Sthambham' and 'Prahlada Mettu'. At a distance of eight kilometres from the Upper Ahobilam temple, we can see a cleft of the mountain dividing it into two visible parts. It is a long-held view that from the cleft, the Lord appeared in the form of Narasimha and this cleft is known as 'Ugra Sthambham'. The small shrine, situated in a cave on the hill, is in between Ugra Sthambham and the Upper Ahobilam. It is dedicated to Prahlada Narashimha Swamy. 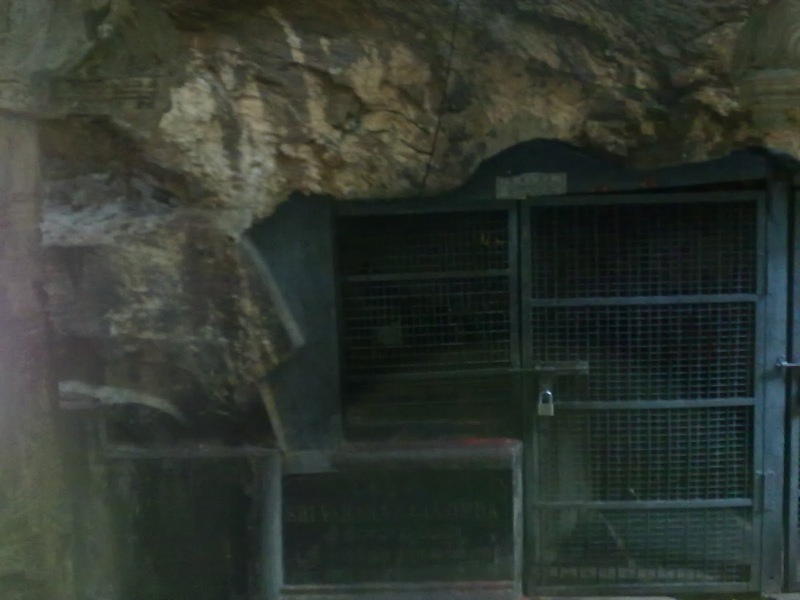 The image of the Prahlada is installed in a small cave. There are a number of holy 'theerthas' (water ponds) round this place. Of these, Rakthakundam is the most important. 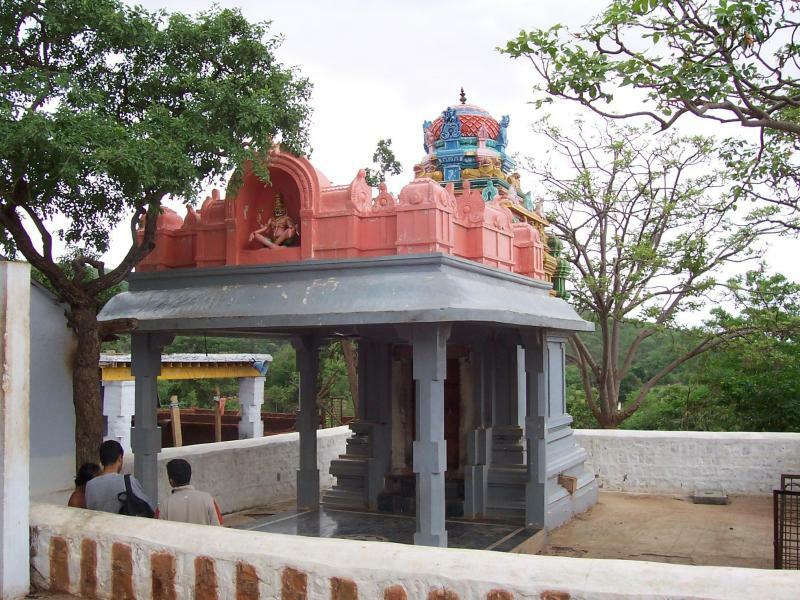 It is stated that Lord Narasirnha after killing the demon Hiranyakasipu, washed his hands in this 'theertham' and hence the water is still reddish in appearance. (History of the cult of Narasimha in Andhra Pradesh by Dr. M. Narasimhacharya). 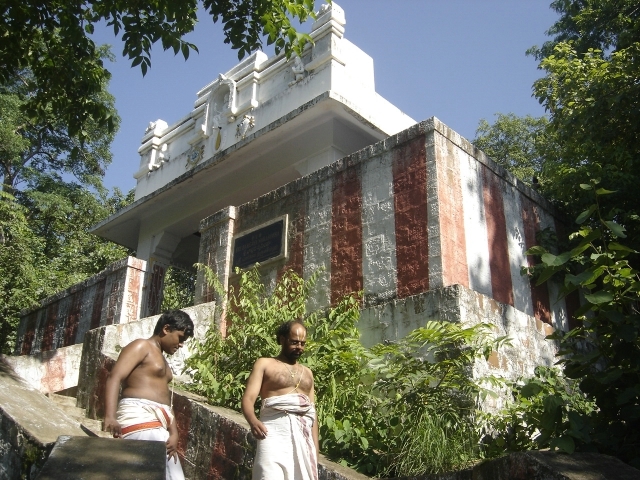 The temple surrounded by three prakaras in the Lower Ahobilam is dedicated to Prahlada Varada i.e., the Lord whose grace bestows on Prahlada. With Vijayanagar style noticeable in the structure, there are a number of mandapas outside the temple. A shrine dedicated to Sri Venkateswara exists to the south west of this Narasimha temple and lends view to the episode that Lord Venkateswara obtained the blessings of Narasimha just before his marriage with Padmavathi. 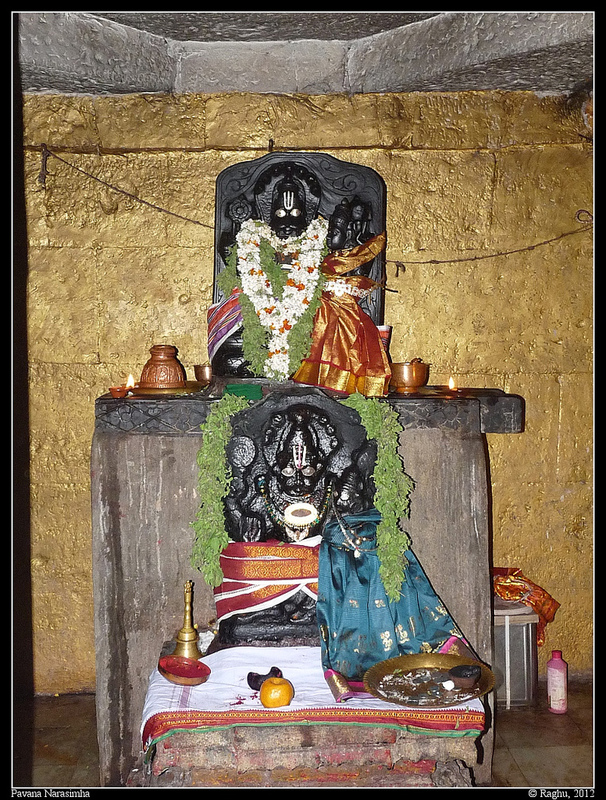 The Mukha Mandapa there, is now used as the Kalyana Mandapa of Narasimha Swamy. With Lakshmeenarasimha as the presiding Deity, the main temple consists of a sanctum, Mukhamandapam and Rangamandapam with numerous pillars intricately carved and carrying rich sculptures. There are also three smaller shrines for Lakshmi, Andal and Azhwars. In the sanctum are also kept the Utsava idols of Prahlada Varada, Pavana Narasimha and the processional idols of Jwala Narasimha endowed with ten hands and with Sreedevi and Bhoodevi on His either side. A small idol of the first Jeeyar, Sri Adivan Satakopa Swami is also kept before them. What is apparent and observable is Lord Narasimha's posture in three places including the one in a polar of a divine ascetic presenting ascetic order to the first Jeeyar of Ahobila Mutt. 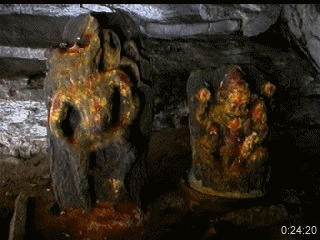 Both in the Upper and Lower Ahobilam, it is a common sight on the pillars of Lord Narasimha wooing His consort Chenchulakshmi. The Lord chasing Hiranyakasipu in one pillar and bursting forth from another pillar to tear him are very realistic. Thanks to the 44th Jeeyar's efforts as also that of the Endowments Department of A.P. Government, the complex has been renovated, though a lot is desired to be done. It would not be out of place to mention that good resting places, free or paid boarding arrangements (as is done in Thirupathi), provision of enough drinking water and Devasthanam canteens would go a long way to attract more number of pilgrims. The annual uthsavam (Brahmothsava) performed in February every year is a great attraction that lure both the common folk and the religious Pandits to participate in them. Though under the care of the Ahobila Mutt whose Jeeyars are hereditary trustees, co-operation from the public and the government would help improve Ahobilam further. There is a tall Jayasthambham erected in the spacious ground outside the temple walls to mark the victory of Krishnadeva Raya. The Kakatheeya Kings especially Prathapa Rudra had also contributed towards additional structures and maintenance of this Ahobilam complex. Sri Thirumangai Azhwar describes the place as very hard to visit (sendru kandarkku ariya kovil, kavvu naayum kazhugum, deivamallal sella vonna), but due to the efforts of the 45th Azhagiyasingar, this place has transformed into "sendru kaandarku eliya (easy) kovil. 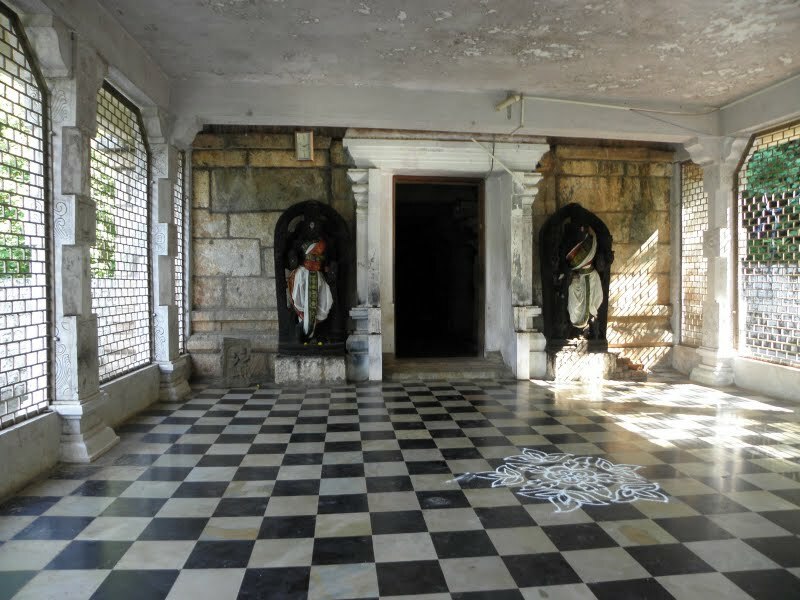 Many devotees visit ahobilam frequently and the place is well connected with a guest house and access to trains from Chennai, Bangalore and Bombay. 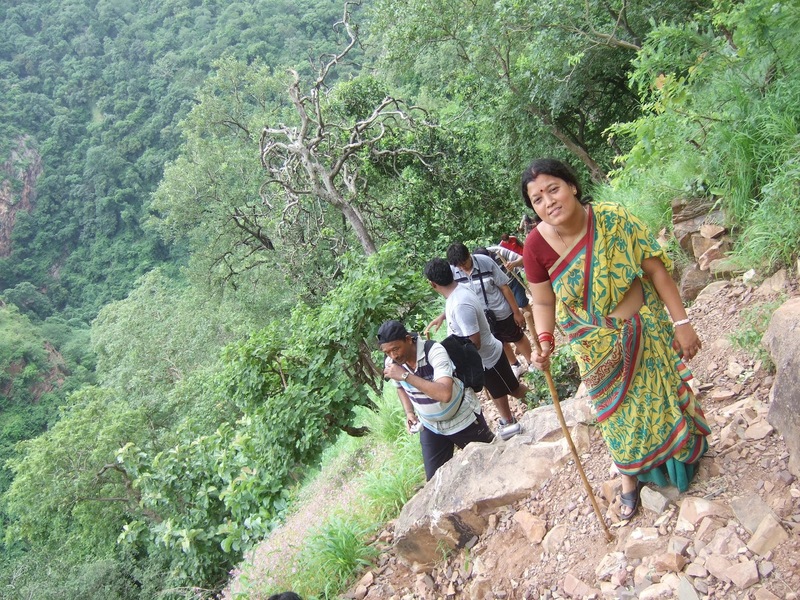 In addition, several tourist operators also frequently arrange religious trips to Ahobilam from major cities. From Bangalore, Ahobilam is about 350 K.m. The train timing is not very convenient from Bangalore. Prasant Express leaves Bangalore at 2:00 p.m. and reaches Nandiyal at about 11:50 p.m. From Nandiyal, Ahobilam is about 60 KM via Allagadda. The return train to Bangalore leaves Nandiyal at about 11:10 p.m. and reaches Bangalore at 10 a.m.
By road, the travel is via Madanapalli, Cuddapah, and Allagadda. The drive is about 7:30 hours. The nearest airport is Hyderabad – about 300 kms. Nearest railway station is Nandyal on the Bengalure-Vishakapatnam route. Another station is Cuddapah on Chennai – Mumbai route. There are three bus routes reaching Ahobilam. 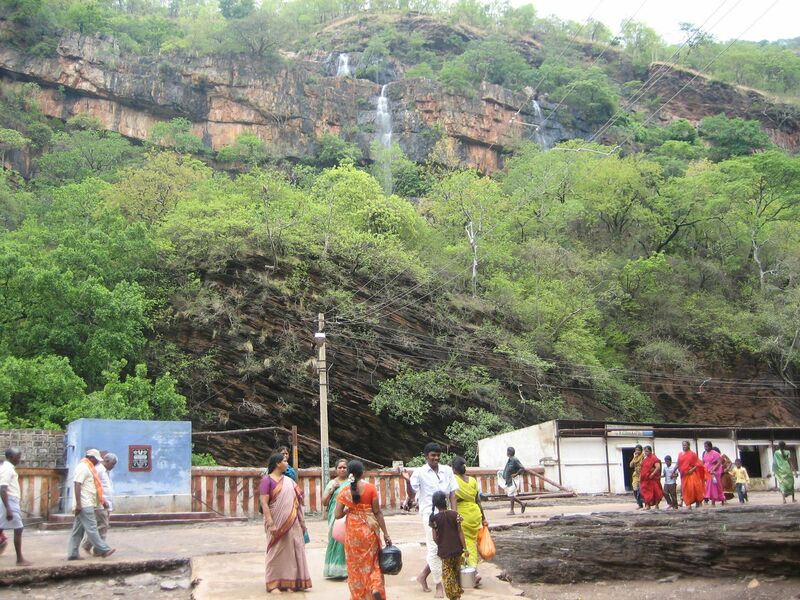 Pilgrims from the north can get down at Nandyal, and travel by bus to Allagadda (30 kms.) and Ahobilam. The second route is from Dhone which is another railway station and from which one can reach Ahobilam via Banganapalle and Koilakuntla. The other and easy route is to get down at Cuddapah. From Cuddapah one has to travel to Allagadda (40 kms.) and from there by bus to Ahobilam. Nandyal to Ahobilam : 74.3 km – about 1 hour. Kurnool to Ahobilam : 141 km – about 2 hours. Srisailam to Ahobilam : 243 km – about 4 hours. Cuddapah to Ahobilam : 114 km – about 1 hour 40 mins. After visiting Ahobilam you should visit Mahanandiswara Swamy Temple - Mahanandi and Srisaila Mallikarjuna and Bhramarambha temple. Very good article providing all the required information about the visit to Ahobilam. The detailed description on each of the nine temples are are quite interesting. Thanks to the author for making this available to all of us. Malolan would bestow his choicest blessings on him. A good article on Ahobilam Nava Narasimha Kshetras. thanks much for your detailed information.